With no run-up distance, high obstacles become very tricky. From a rear wheel position, you can always launch a side hop and hook your bash plate or your pedal to the obstacle's edge. Benito Ros lands with the pedal onto the edge. If you can't pull enough power to land directly on both wheels, this tricky approach saves you about a wheel's diameter worth of side hop effort. 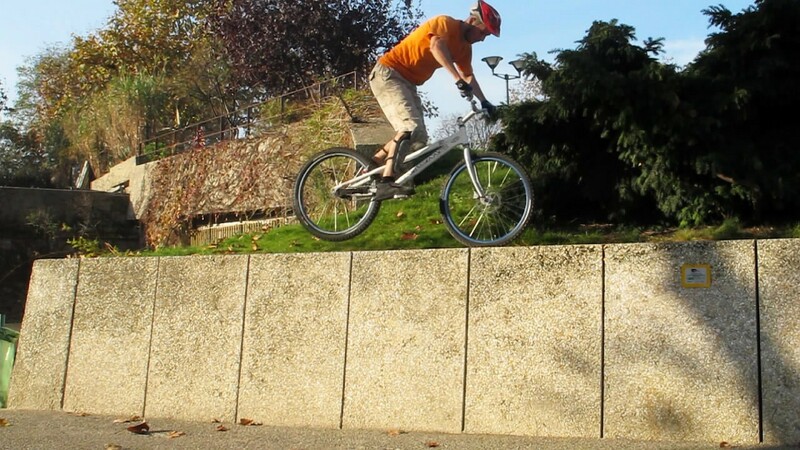 A dreadful perspective for your pedals, this variant of the side hop can be performed on both sides, though it is usually better to hook the obstacle with your back pedal as it enables you to land better positioned for a static hop. It is very useful in natural bike trials competitions by the BIU rules where pedal and bash guard support are allowed. Nicolas Vuillermot moves up onto his back pedal. Launch a side hop with the obstacle on your lazy foot side. 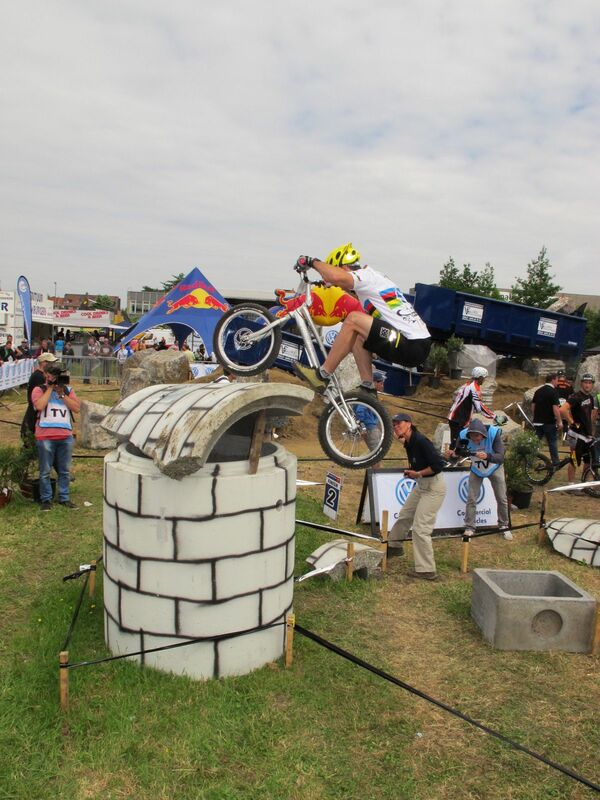 Aim your front wheel at the top of the obstacle as you jump into a full extension. Hook your back pedal and possibly also the front wheel onto the obstacle and try to hang to it by keeping your weight over the resting pedal. Recover your balance in a standing position with your lazy foot on the resting pedal, strong foot up. Lean well over the resting pedal to secure your balance over the obstacle. Then flex for a firm static hop supported by a small endo, tilting the bike on its front wheel to pull the rear wheel on top of the obstacle. 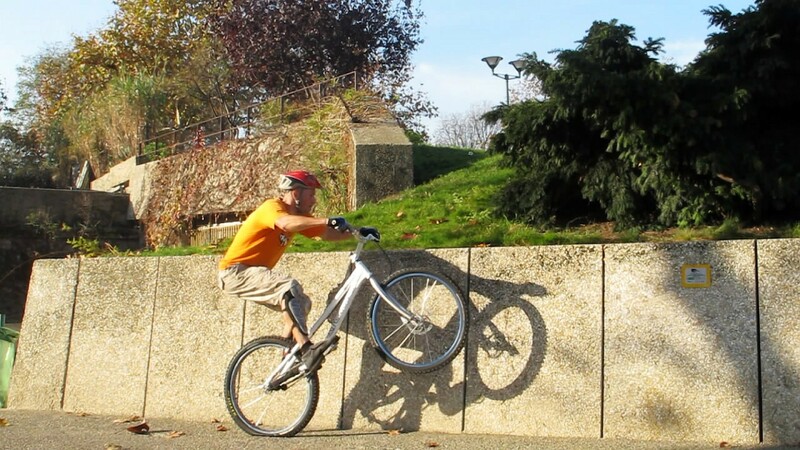 Alternatively, if the edge is too narrow, perform a one-legged static hop to land to back wheel. 1° Launch a side hop with the obstacle on your lazy foot side (back pedal). 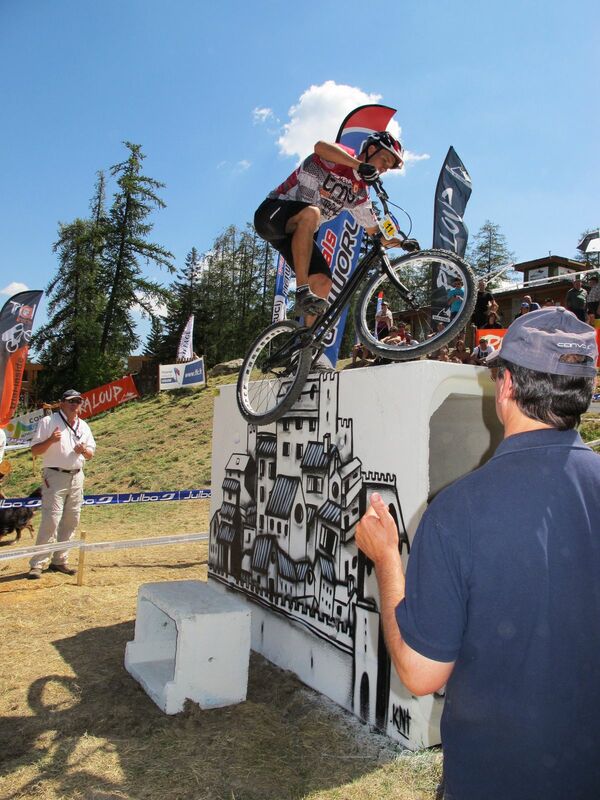 2° Aim your front wheel at the top of the obstacle as you jump into a full extension. 3° Hook your back pedal and possibly also the front wheel onto the obstacle and try to hang to it. 4° Recover your balance in a standing position with your lazy foot on the resting pedal, strong foot up. 5° Then flex for a firm static hop supported by a small endo. 6° Tilt the bike on its front wheel to pull the rear wheel up, over the obstacle. If you have room to land the front wheel across the obstacle while sticking your pedal to its edge, then you can use that extra support and roll on the front wheel with a weight transfer to lift the rear wheel up. This will be easier than relying on a one-legged static hop on your lazy foot. To make this technique useful, you must be able to balance on one foot while the whole bike is hanging. 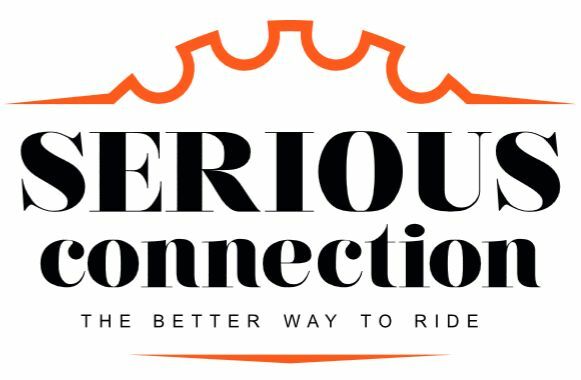 This requires a lot of practise, the bike tends to drag you off-balance as you hang desperately onto that suffering pedal. It is especially awkward if you end up fully tucked, at the maximum height of your side hop capability. From there, try to slowly recover a comfortable position on your standing leg. Try this on both sides as you may discover you are more comfortable on the other side.